Joe Sellmansberger, tuba, resides in rural western Tennessee in a log cabin and performs with the Jackson Symphony, the Memphis Symphony, the University of Mississippi Brass Quintet, several traditional jazz bands, and (of course) IRIS. Joe and his wife, Debbie established Mid-South Music in 1979 where they repair, restore, and sell upscale brass and woodwind instruments. 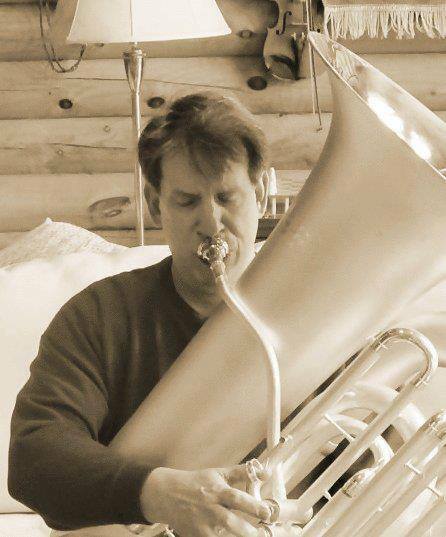 Joe has built some of his own tubas and has designed and markets a highly successful line of modular stainless steel tuba mouthpieces known as the Sellmansberger “Solo”, “Imperial”, “Symphony”, and “Orchestra Grand” models. Debbie embraces the log cabin existence with her spinning, weaving, shepherding, poultry, beekeeping, orchard, gardening, fishing, and her festivals related enterprise, Celtic Corner. Joe and Debbie are delighted with their three grandchildren in Pittsburgh, as their son-in-law plays horn in the Pittsburgh Symphony.